For the Soviet-era party, see Communist Party of Moldova. The Party of Communists of the Republic of Moldova (Romanian: Partidul Comuniștilor din Republica Moldova (PCRM), Moldovan Cyrillic: Партидул Комуништилор дин Република Молдова (ПКРМ), Russian: Партия коммунистов Республики Молдова, Partiya kommunistov Respubliki Moldova) is a communist party in Moldova led by Vladimir Voronin. It is the only communist party to have held a majority in government in the post-Soviet states. The PCRM is part of the Party of the European Left. Republic! Power to the people! Socialism! The PCRM was registered as a political party in 1994. The PCRM was part of the Popular Patriotic Forces Front at the time of the 1996 presidential election, in which Voronin stood as the coalition's candidate and won 10.3% of the vote, placing third. The party supported Petru Lucinschi in the second round of the election, and following Lucinschi's victory the PCRM was given two positions in the government. In the March 1998 parliamentary election, the PCRM won 30.1% of the vote and 40 seats, becoming the largest party in parliament; in its platform, it called for "the rebirth of a socialist society". Despite its strong showing, the PCRM was left in opposition due to the formation of a center-right coalition government, Alliance for Democracy and Reforms. 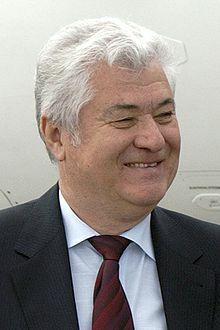 Although Lucinschi later nominated Voronin as Prime Minister of Moldova in late 1999, the nomination was unsuccessful because Voronin did not have enough support in parliament. The PCRM received 49.9% of the vote in the February 2001 parliamentary election, winning 71 out of the 101 seats in parliament. With a PCRM parliamentary majority, Voronin was elected as President by parliament in April 2001. The Constitutional Court ruled that the President could also lead a political party, and Voronin was re-elected as party leader. As the ruling political party in Moldova, it won the Moldovan parliamentary election, 2005, and provided the President, Vladimir Voronin, the Prime Minister, Zinaida Greceanîi, and the Speaker of the Moldovan Parliament, Marian Lupu. Under Voronin, it privatized several state-owned industries and governed in a multi-party fashion. It also favors European integration and eventual EU membership. After April 2009 election and the civil unrest, the climate in Moldova became very polarized. The parliament failed to elect a new president. For this reason, the parliament was dissolved and snap elections were held. At the July 29 polls the Communist Party received 44.7% of the vote. That gave the former ruling party 48 MPs, and the remaining 53 seats in the 101-member chamber went to four opposition parties, Alliance For European Integration. For the first time since 2001, communists went into opposition. After the Parliament failed to elect a new President of the Republic, snap elections were called. In the election, PCRM obtained 39.34% of votes, winning 42 seats, going again into opposition to the Alliance of European Integration. In 2011 Igor Dodon and Zinaida Greceanîi left the party and joined the Party of Socialists of the Republic of Moldova (PSRM). Parliamentary election of 2014 saw a great defeat for PCRM, which received only 17.48% of votes, losing more than half of its electors to PSRM and electing 21 seats. Following the elections, the party agreed to give confidence and supply to the new Gaburici Cabinet. The Agreement collapsed in June 2015 and PCRM went back into opposition. In 2016, the party suffered a large split as 14 MPS left PCRM faction and established the Social Democratic Platform for Moldova, joining the majority of Filip Cabinet. On 10 March 2017, all 14 MPs joined the Democratic Party of Moldova. Since then, the party rapidly declined in polls, losing most of its votes to PSRM and PDM. In the 2019 parliamentary election PCRM collapsed, receiving only 3,75% of votes and losing all representation in the Parliament. According to its Statute adopted in 2008, article 1, the Party of Communists of the Republic of Moldova is a "lawful successor and heir of the Communist Party of [Soviet] Moldavia both in terms of ideas and traditions". While officially espousing a Leninist communist doctrine, there is debate over their policies. The Economist considers it a centre-right party, communist only in name, whereas Romanian political scientist Vladimir Tismăneanu argues that the party is communist in the classical sense, as it has not changed much since the fall of the Soviet Union. Ion Marandici, a Moldovan political scientist considers that the success story of the Moldovan Communists is mainly due to the Communists' capacity to attract the votes of the ethnic minorities and the Romanian-speakers identifying as Moldovans, by proposing a Moldovenist nation and state-project. The decline of the Communists followed after Marian Lupu, a key figure in Moldovan politics, left the Communists Party and joined the Democratic Party, thus bringing with him the Moldovan supporters of the Communists. The party is strongly opposed to any unification of Romania and Moldova. ^ a b c "Partidul Comuniştilor din Republica Moldova (PCRM)". Retrieved 25 February 2019. ^ Nordsieck, Wolfram (2019). "Moldova". Parties and Elections in Europe. Retrieved 13 April 2019. ^ The Communist Party of the Russian Federation (CPRF) won two parliamentary elections in the 1990s by receiving a plurality (but notably not a majority) of seats in the Duma, however since Russia is a Presidential Republic (and Boris Yeltsin was President at the time), the CPRF was unable to form a government. The Communist Party of South Ossetia, which was de facto independent at the time, won a majority of seats in the 1994 election. ^ a b Political Parties of the World (6th edition, 2005), ed. Bogdan Szajkowski, page 414.